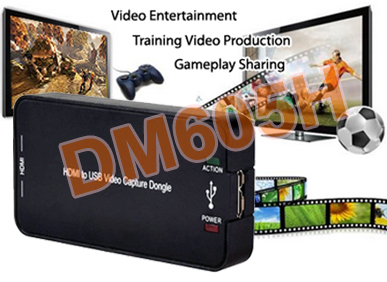 This USB HDMI video capture device allows user to record their favorite video game play, computer HDMI DVI screen or other HDMI content at HD resolution up to 1080p. This HDMI to USB video capture dongle is a high performance USB HDMI DVR adapter, designed to fulfill any high-density HD capture or encoding demands. Featured with supreme quality H.264 hardware encoder for quality video recordings in real time with no lags. External HDMI video feeds can be recorded and encoded into H.264 MPEG-4 format, which exceeds all other video compression standards in quality with less storage drive space consumption, providing crisp clear images and sounds. Recommended for installation in Windows 7, Win8/8.1 and Windows 10. 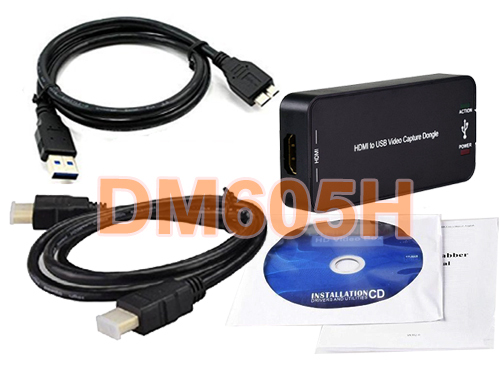 Users can use this PC-based HDMI DVR adapter for recording HDMI or DVI output from computer, HD media player, PS4, multimedia server, camcorder or other HDMI DVI equipments into PC for training/tutorial videos, presentation or entertainment purpose. 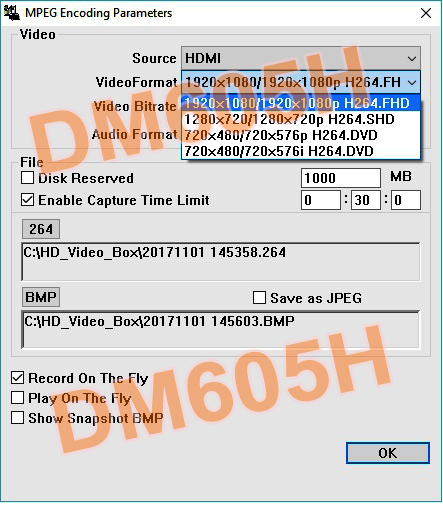 [Note]: This device will not record those copyrighted HDMI content with HDCP encrypted from commercial sources such as blu-ray player, HD cable box, etc. This USB 3.0 HDMI video frame grabber has H.264 hardware encoder built in, which can compresses digital video file very efficiently, using much less than 1/5 of the space what MPEG-2 DVD file takes. Other video formats such as such as AVI, MP4, MPEG1, MPEG2, WMV, QTMOV, ASF can be converted and exported by using other 3rd party video software to convert from the recorded files. This USB 3.0 HDMI DVR adapter is designed for optimal performance using USB 3.0 hookup. However it is also backwards compatible with all PCs equipped with USB 2.0 ports for smooth operation as well. 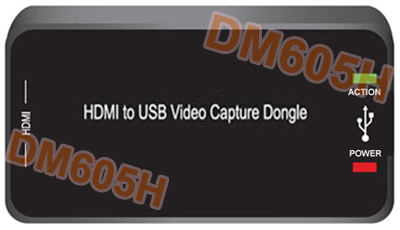 Now running at lightning fast speeds, this DM605H model is able to transfer uncompressed video to your computer in HD resolution at 60 fps. It supports Windows OS and most recommended for setup in Windows 7, Win8/8.1 and Windows 10. This HDMI video capture recorder package is bundled with full-featured PC-based DVR software for viewing/recording HDMI or DVI feeds and saving the recorded content into the hard drive for playback or further video production. HDMI recording quality can be manually selected from the DVR software at 1080p, 720p, 576p, 480p, 576i, 480i at H264FHD or H264.DVD encoding. Users can play and record HD video games from the HDMI output while playing, preserving smooth gameplay - especially for fast-moving FPS and sports games. The maximum recording quality can be up to 1920x1080p. [Note]: When recording the HDMI output from PS4, it is required to disable HDCP in PS4 settings before recording. Powerful 3D video filer technology is incorporated into this digital HD video frame grabber unit to minimize the noisy artifacts and retain accurate color, resulting in sharper and cleaner video pictures for optimal recording quality. 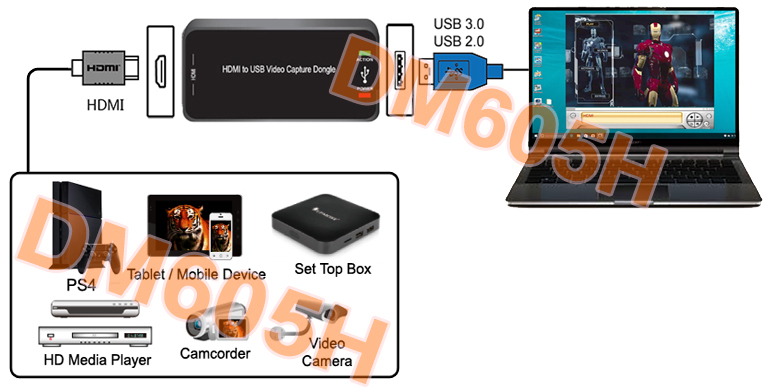 Premium USB 3.0/USB 2.0 HDMI video capture device bundled with full-featured DVR software for viewing/recording HDMI or DVI feeds through PC system. Real-time HD video capture using H.264 hardware encoder with efficient compression so file size uses much less storage drive space. Easy and cost efficient solution of recording HDMI or component video into HD footages into sharp and clear MPEG4 format. 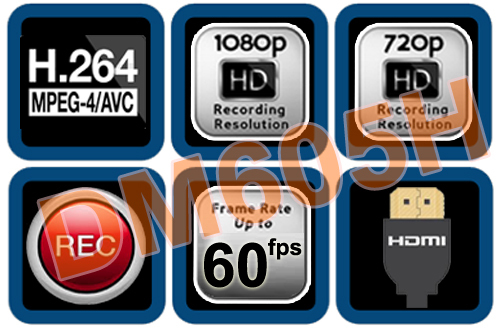 Adopts MP4 (H.264/AAC) as the recording format with maximum recording resolution at 1080P/60 FPS. Designed to fulfill any high-density HD capture or encoding demands. Compliant with HDMI and HDCP copy protection. Designed for optimal performance using USB 3.0 hookup and also backwards compatible with all PCs equipped with USB 2.0. Supports all HDMI or DVI video input resolutions in real time capturing. HDMI recording quality can be manually selected from the DVR software and performed at 1080p, 720p at H.264FHD and 576p/576i, 480p/480i at H.264.DVD encoding. Powerful 3D filer technology to minimize artifacts and retain accurate color, resulting in sharper and cleaner video pictures for optimal recording quality. Supports playback on the fly and recording on the fly mode. Play favorite PS4 games while capturing your best moves in non-HDCP mode. 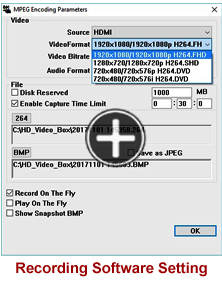 Supports snapshot function through the supplied video software to take still picture of video theme in BMP format. Recommended for setup in Windows 7, Win8/8.1 and Windows 10.